Sauté the onion for 2 to 3 minutes until it becomes translucent. Add the chopped tomatoes, green chili peppers, and the garlic; sauté for 3 minutes. Add the ground beef and cook for 10 minutes, stirring from time to time, until all the beef has browned. Reduce the heat to low; add salt and pepper to taste. Remove from the heat and let cool completely. When the beef has cooled enough, heat the oven to 350°F. Spray a baking dish with vegetable cooking spray. For the empanadas, split each biscuit in half. Spread each half on a floured surface until you have a 1/4 inch circle. Fill each circle with 3 tablespoons of the ground beef filing. Sprinkle 1 tablespoon of shredded cheddar cheese on top of the beef. Fold the dough in half and seal the edges with a fork. Prick the surface of each empanada 2 or 3 times with a fork. Arrange the empanadas on the baking dish. Bake the empanadas for 12-15 minutes or until the dough becomes golden brown. Remove from the oven. To serve, garnish with lettuce and chopped tomato, alongside taco sauce or your favorite hot sauce. Bon appetit! Serve these empanadas with sour cream and/or guacamole. I have something to confess... even though I have lived in Mexico for a long time, surrounded by taco stands on every corner, many times what I really crave are Tex-Mex-style, ground beef tacos. Not just tacos, because this spicy ground beef filling also lends itself for tostadas, burritos, and even empanadas. I really love Tex-Mex style taco empanadas. Ground beef cooked with tomato, onion, garlic, green chili peppers, and various hot spices, wrapped in a soft biscuit dough. All served with lettuce, chopped tomatoes, shredded cheese, sour cream, and your favorite hot sauce. 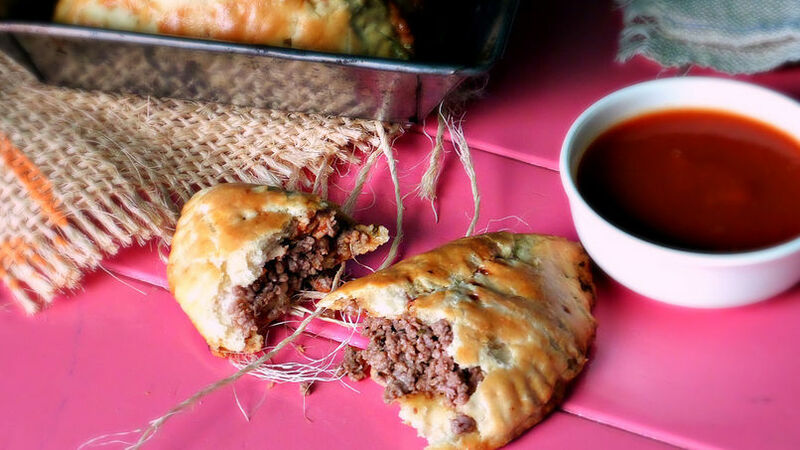 With these ground beef empanadas, dinnertime will turn into a Tex-Mex fiesta!